Inventory control for a Cosmetics and Jewellery is unique. When selling items like Cosmetics and Jewellery, you must take into account that the same model comes in different sizes and different colors. This can inflate your inventory levels exponentially and make it difficult to track what you have in stock, what you need to order and what is selling well. 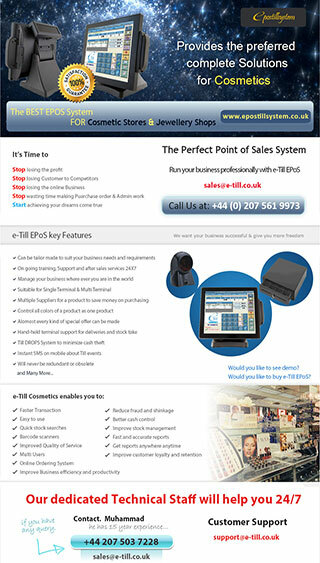 Cosmetics and Jewellery Till System makes it easy for you with special features like Product Group info. Not only will you save money with tighter inventory control and reduced theft, but you will keep your customers happy with fast checkout and special discount deals with Cosmetics and Jewellery Till System and make more money. (Registered Customers Can Order Directly from Website, Agents can make Invoices through phone. 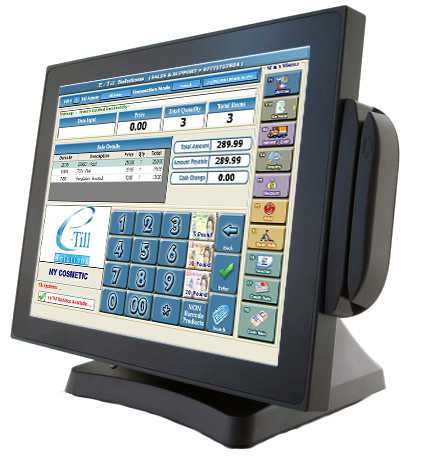 Intelligent Purchase Ordering System to Save a lot of money while purchasing a product that has more then one Importers / Distributors. Product Special Offers can be made. Product Sizes & Colors can be managed easily on one place. Product Inquiry with Stock & Location. Product's Store & Shelf Stock can be manage. Till Discount Option To Give Discount in Percentage. Till Discount Option To Give Discount in Amount. Till Discount Discount Can Be Round in (Pence, Half / Full Pound). Till Discount Discount Can Be Password Protected. Good Return with Cash OR Voucher option. Cash, Credit Card & Vouchers Details provided on Z-Reading.